GE Lighting and US startup Bytelight have unveiled a marketing platform that lets merchants use LED lighting installed in and around their stores to send offers, directions to particular products and information services to shoppers, based on their precise location within a retail store. The new service combines GE’s Luminaire IS LED lighting technology with Bluetooth Low Energy (BLE), inertial device sensors and Visual Light Communication (VLC), a data communications medium that uses visible light between 400 and 800 THz to enable retailers to communicate with shoppers. Customers need to have downloaded an app to an iOS or Android smartphone equipped with camera or Bluetooth Smart to use the service. 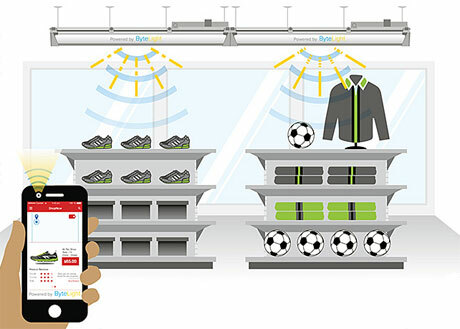 The Bytelight-enabled LED fixtures transmit a unique light pattern that can then be picked up by a shopper’s smartphone and used by the app to notify the Bytelight platform of their location “with sub-meter accuracy and sub-second latency”. Present customer reviews, play product information videos and connect on demand with virtual store associates to make brand choice easier. “ByteLight’s indoor location technology embedded inside GE LED lighting fixtures will deliver high-value applications to retailers, providing the ability to understand the precise location of shoppers using an opt-in application powered by ByteLight on their smartphones and tablets,” GE says. “The use of GE’s LED lighting fixtures for location-based services brilliantly demonstrates how LEDs can go beyond the traditional ROI of energy and maintenance savings to fundamentally change the way people shop by combining data with location,” says GE Lighting’s Jerry Duffy. “The value proposition for LED lighting is becoming less about illumination and more about innovative applications and services that digital light enables,” adds Dan Ryan, ByteLight’s CEO. Lighting rival Philips has also developed a system that uses VLC to communicate location-based information to shoppers via a smartphone app. The app lets customers select a recipe or an individual item to receive directions to the aisle in which the product is located.